What secrets lay within the walls of the house by the lock? What secrets, if any, are held by the man who owns that mysterious house? A body is found in a backwater creek not far from the house by the lock, but what leads Noel Stanton on a quest to determine who the killer might be is more than merely the disappearance of his American friend Harvey Farnham. He has reason to believe that the wealthy and influential owner of the house, Carson Wildred, might somehow be implicated in the coincidental disappearance and murder. 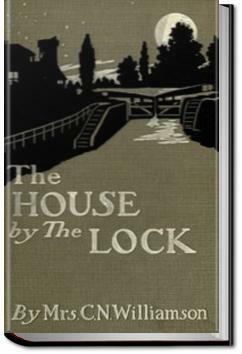 But as Stanton’s search progresses, he learns that his friend is safe and sound back in the U.S. and he therefore must learn more about the house itself with its peculiar construction, it’s hidden passageways, and the peculiar smoke occasionally seen rising from its inaccessible areas. But everything is accounted for by the police, the servants, and Mr. Wildred during his investigation, leaving a most strange mystery left for Stanton to unravel. . . .I had fancied that the square, squat wall must be that of a studio, as there were no windows, but a high, domed skylight on top. Now I saw that though the outer building was square, the room within was octagon in shape. It was, perhaps, a studio, as I had fancied, but there was something of the free-and-easy negligence of an Oriental smoking-room about it. This book has all the requirements for a gothic tale: a damsel in distress, a handsome adventurer, a clever villain, narrow escapes, visions, disguises and a thrilling ending. not what I expected! It's rather a crime-mystery with adventure than a cold-blooded calculated murder with scientifically unraveling a murderer and a plot. The latter can be found in the Christie's books. I love when everything comes together by the end; all questions answered! But, if course, make you wait--at least I didn't figure it all out on my own! One of the Williamson's mysteries. I found it gave a thrill up my spine. Another novel by a turn of the century author, a woman. I like Ms. Williamson's books. They're good stories that are easy to read and take you back to another era. For me they're just fun reads. Sorry but did not like it that much, not much of a thrill or twist. I would say it's good for reading on the train to pass the time.